With a few tweaks to the hull, partitioned bedrooms and all the modern conveniences added, we've converted these 'Kettuvalloms' as they are called, into elegant floating homes that cruise the inland sea of the Vembanad near our Coconut Lagoon property. Made completely from natural materials, the boats are powered by solar energy and vegetable oil. Canopies of cane and rattan blend into coir-matted decks creating a warm, natural ambience that's almost entirely hand-crafted. With it's cane and rope awnings flying rakishly, its silent hull gliding past as if on wings of air, a houseboat seems to do more than just belong to this world of palms and water. It seems to have been birthed from it. Fitted with one/two ensuite bedrooms, and a living room. 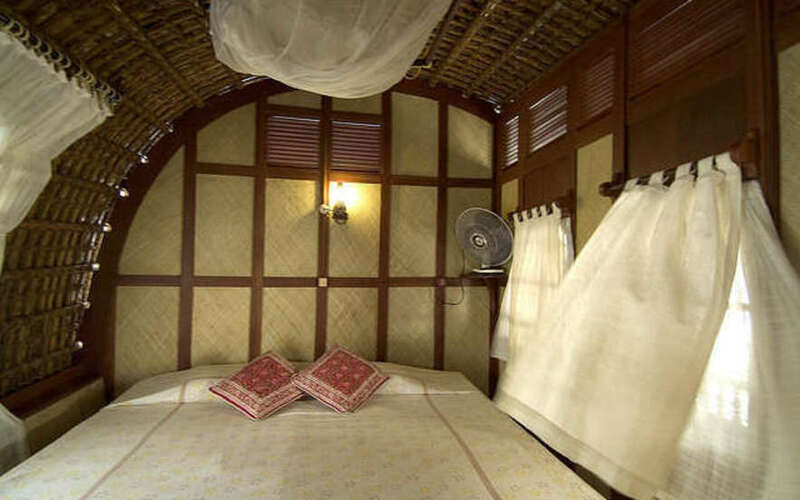 Bedrooms are warm, cozy spaces with mesh windows that let in the palm-scented breeze, even as they keep little insects at bay. With the rhythmic cries of the cicadas and the gentle lap-lap of moving water as your background music, you can look forward to an amazingly restful night out on the lake's centre.